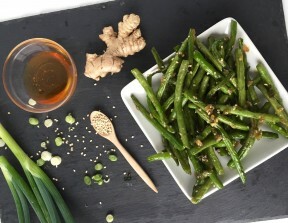 Bring your green beans to life with this flavorful recipe which requires minimal oil compared to the traditional Asian dish. Sauté oil, garlic, and ginger for 1 minute. Add green onion and green beans and cook for 2-3 minutes. Cover and continue to cook for 6-8 minutes, until al dente (still slightly crisp). Top with sesame seeds and Bragg’s (or light soy sauce).